Research questions in our lab revolve around disinhibited behavior of various kinds. Dr. Taylor's primary interests are in causes and correlates of substance use disorders, Cluster B personality disorders (antisocial, borderline, narcissistic, and histrionic), and their comorbidity. The fundamental question is that of individual differences: why​ does one person develop substance abuse or become antisocial while another person does not? What factors contribute to the development and/or maintenance of disinhibited disorders? Graduate students in the lab drive our direction at any given time as they forge their scientific interests. This makes for a dynamic and changing landscape in the lab that allows students to ask the questions that interest them and (hopefully) find some answers. ​A hallmark of the Taylor Lab is the variety of methodologies used to test research questions in order to reach a fuller understanding of an issue. This is an experimental psychopathology lab. 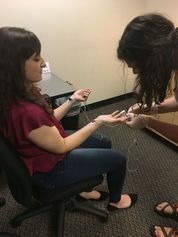 Most studies include traditional methods of self-report and clinical interviews, but many are supplemented with psychophysiological measurements (skin conductance, EKG, EMG) and computerized cognitive tasks (e.g., stop signal reaction time). Of course, the research question drives the methods used, but there is opportunity to learn about and use a variety of methods in our lab. In addition to the one or two lab studies going on at any given time, Dr. Taylor and her graduate students also conduct research using various datasets from the lab or from other collaborators or collected through online resources (e.g., MTurk; social media). 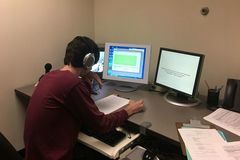 *Photos show undergraduate students in the lab practicing the Emotion and NSSI study on the lab coordinator. ​Two studies have been conducted that examine how emotion states (happy, sad, angry, and neutral) influence motor impulsivity (stop signal reaction time) and reward-based impulsivity. Physiological measurements taken during one of the studies provides a means of assessing arousal during the emotion induction and during one of the impulsivity tasks. Social Context Effects on Alcohol Memories - Examined whether the mere presence of other people (without interaction) caused facilitation of alcohol-related memory networks using implicit memory tasks. Subjective Effects of Substances - Developed a measure to assess the subjective hedonic effects that substance abusers like about their drug of choice and whether assessing those effects could predict specific substance use disorders. Genetic and Environment Influences on Oppositional Defiant Disorder - Examined the proposed DSM 5 factors of oppositional defiant disorder and the relative association with genetic and environmental factors using data on twins in the Minnesota Twin Family Study. Cortisol Stress Response and Aggression in Male Offenders with Antisocial Personality Disorder - Examined cortisol response profiles to a social stress task and proactive and reactive aggression in incarcerated young adult men with antisocial personality disorder. Rumination Effects on Alcohol Consumption in Relation to Borderline Personality Disorder - Tested the idea that women with features of borderline personality disorder will engage in alcohol use as a means to regulate negative emotion created during rumination. Effects of Emotional Dysregulation on Behavioral Dysregulation in Borderline Personality Disorder - Tested Linehan's (2003) biosocial theory that behavioral dysregulation in women with borderline personality disorder is the result of emotional dysregulation. Psychopathy and Proactive and Reactive Aggression in Subtypes of Narcissism - Examined psychopathy traits and physiological profiles of aggression in people with grandiose vs. vulnerable narcissism. Invalidation in Relation to Emotional Dysregulation - Tested Linehan's (2003) biosocial theory that invalidation of emotional reactions results in emotional dysregulation.